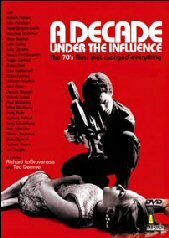 A documentary showcasing what went on behind the greatest movies of the 1970's in a period where there was not a great deal of movies coming out and attendance at these movies was fairly low. I was a child of the 70's and remember with fondness the era. Mind you, the majority of my viewing consisted of kids shows and Star Wars, however I can say that I did view some of these flicks during the period they were made. An odd thing that I do have to say about this flick is that I have seen the R1 version and it runs for about three hours or so compared to the 108 minutes of the R4 version. As a result whilst the feature flows well, there were moments that I did feel that we were missing a little something. Directed by Ted Demme (actually his last film before his death in 2003), we go behind the scenes of the great movies of the time such as Rocky, Easy Rider, The Exorcist, The Godfather, Taxi Driver and others and then are lucky enough to be able to watch interviews with the pioneering writers, directors and actors who made this magic happen in a time of great social upheaval. I personally found the entire disc fascinating and especially loved how the feature was interspersed with footage from the movies that were being discussed, along with key scenes or highlights from those films. I don't know what Demme had to do to get all these people to make themselves available to go into such depth for this feature however I am certainly not complaining. I think that this feature is marvelous, however it will only really appeal to fans of great cinema who can see beyond the great special effects that we take for granted today. To some younger viewers, this feature may appear to be coverage of titles that mean nothing to them but I can reassure you that if not for these movies, the ones that you are enjoying today would most likely have not been made. The movies of the 70's paved the way for moviemakers to go out on a limb and try new things. They didn't always work, however as in the case of these featured films, not only did they work, but they worked stunningly. 16:9 here and all the main interviews are nice and sharp. It's just when we are shown some of the older footage that we do some some errors however this is to do with the source material and not the transfer onto DVD. Dolby 2.0 and no subwoofer use. This is a doco after all and anything more would just be a waste to put it frankly. The special features here are a treat and for those who got into the main feature will feel that the extras strongly expound upon it. There are additional interviews that run for about half an hour, some biographies and Umbrella Propaganda.